India’s poorest rural communities also face entrenched economic discrimination from mainstream populations. Lack of job opportunities in neglected, particularly rural communities in India is causing socioeconomic stagnation and encouraging youth outmigration in search of better prospects; there has been a particularly drastic decline in the numbers of women in rural employment. The apparent lack of rural job creation persists despite India’s growing economy, with ruinous impacts on local economies and detrimental to the continuity of cultural identities. 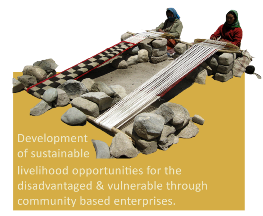 Our Livelihoods and Enterprise Development programme is helping lift deprived communities out of poverty, providing vital inputs and training across both traditional and niche-sector occupations. >> Pragya is skilling youth through the vocational courses training and promoting local enterprise along with facilitating access to employment in India. >> Growing Medicinal and aromatic plants, is becoming a lucrative economic opportunity for poor communities struggling to earn a living, in India and Kenya. >> Livelihood alternatives are being provided to beneficiaries in disaster-affected areas of Nepal. >> Our team recently organized the livestock distribution for the char community in Lohaujong to attain sustainable livelihood. >> The Resource Centres and Mobile Vikas Kendras in collaboration with @Alstom are providing education and vocational skillbuilding in Madhepura.